Finally there is “Blowin’ In The Wind,” again broadcasted on Spanish TV and one of the most exciting performances of Dylan ever filmed. The footage of the last encore, “Blowin’ In The Wind” is priceless. 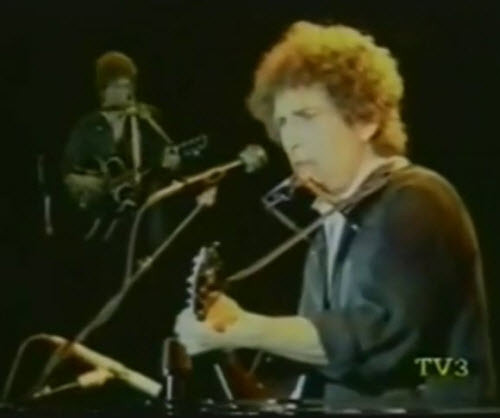 Dylan had been encouraging the fans to sing along on the choruses to this song for about two weeks, but on this evening the crowd – who had been wonderful all through the performance.. – caught Dylan by surprise. They started singing – loudly and in fine harmony – at the first chorus.. , and Dylan is visibly and audibly startled, and then deeply moved.